Parents urged: ‘Please respect the new road markings’. 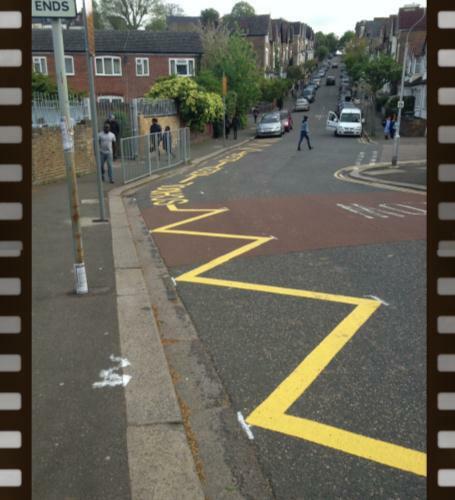 Pupils, parents and staff have welcomed the new road zig zag markings at the Rockmount Road entrance to the school. Croydon Council painted the new markings after a long campaign over the May bank holiday weekend. “At last the council have made these safety improvements to the Rockmount Road entrance. It was very dangerous before with cars parked on both sides for dropping off. Pupils were forced to cross the road between parked cars with poor visibility and there have been a number of incidents and near-misses. Now the school side of the road is clear of cars and visibility is much better." We understand it means that some parents now have to park their car around the corner on Chevening Road and walk around the corner – but it's worth it for the safety improvements. We ask everyone using a car to drive slowly and not to park in the yellow zig zag area. Our local Police Community Support Officers wrote to Croydon to support the planning application and they will, if necessary, issue parking tickets to anyone who ignores the new markings. We all want to avoid this. Teacher Suzanne Jessel said, "It is wonderful to see increasing numbers of families walking or cycling to school. Some parents are having a go at parking on the far side of the Recreation Grounds and enjoying a walk through the lovely park opposite the school to start the day with a little healthy exercise. All this helps make the school gates a child friendly zone at the beginning of each school day."